How difficult is it to learn “the pipes”? 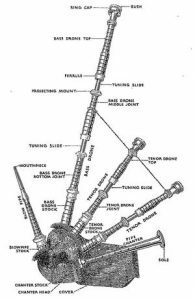 The Great Highland Bagpipe is no more difficult to learn than any other instrument. Age isn’t a barrier. One thing you will need is a reasonable level of fitness. As a piper, you’ll develop a good set of lungs. Piping is good for you! So I start out with a practice chanter, but how long does it take before I get to play the pipes? Students learn at their own pace, but if you’re really keen, you could be playing some tunes with the Band within 3-6 months. It usually takes another year to build your repertoire – pipe bands don’t carry music when they play, so you have to know the tunes by heart. Okay, I’m game. What do I do now? Click here to organise your first lesson and let’s get you started! What can I expect when I start learning the pipes? 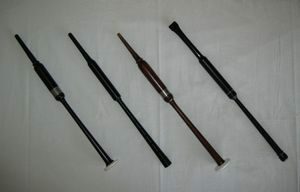 All pipers use a practice chanter to practice finger movements and learn new tunes. Pipers never give up their practice chanters, but the practice chanter is where everyone’s piping journey begins. Like every instrument, you’re going to have to start by learning scales and to read music (if you already know how to read music, that’s great, but you’ll find pipe music slightly different). After mastering simple scales, you’ll learn basic embellishments – the pipes have just nine notes, so we use a lot of embellishments to compensate. Once you’ve got the basic embellishments under control, you’ll be taught more challenging exercises and begin learning tunes. 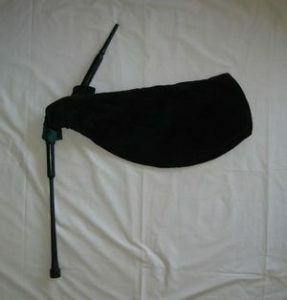 A goose is a bagpipe bag with a blowpipe and chanter but no drones (sometimes, a set of pipes with the drones blocked). A goose is used to teach bag and breathing control. You’ll notice that playing with a bag under your arm is different from playing the practice chanter. It can be a bit frustrating at first, but keep trying and you’ll get the idea. By the way, you’ll still be practicing exercises and tunes on your practice chanter. If you’re really keen you can skip the Goose phase and go straight onto pipes, but with a new set of Bagpipes costing upwards of $1,800.00, you might want to consider a Goose first, just to be sure you’re fit enough and still keen to move onto investing in your own set of Bagpipes. Just when you’ve got the hang of the goose, we introduce you to the drones. If you haven’t been using a full set of pipes, you’ll now be able to use one of the Band’s set (most pipers buy their own pipes eventually, but the Band has sets for you to use so long as you’re an active member). By now you’ll have built your lung capacity, but it’s likely you’ll still find it challenging to play for the first few months. Keep going. Almost there. 4. I’m on the Pipes! Congratulations! You’re going on your first turn-out with the Band. The Quartermaster has issued you a uniform: Glengarry (hat), tie, shirt, sporran (a.k.a. man purse), kilt, socks (a.k.a. stockings), and flashes (those little red tabs we wear below the turn-downs of our socks) – all you need to supply are your own shoes (ghillie brogues). Don’t be nervous – there are plenty of other pipers to back you up. You won’t be marching this time, so that’s one less thing to worry about. Just concentrate on the music. After a few “static” turn-outs, you’ll know how it feels to play with the Band. Now it’s time to learn to march. It’s not as easy as it sometimes looks, but you’ll get it before too long. If you live near a beach, it’s a perfect place to play and practice marching. (We recommend low tide for obvious reasons). 6. But wait, there’s more! So, you can play the massed-band sets, you can march, and are learning new tunes all the time. Great! It’s probably been a couple of years since your first lesson, and you’re a competent and enthusiastic Piper, but you want more. Now there are schools, competitions and cèilidhean. As a member of a recognised band, you can enter and compete, either as part of our competition band or as an individual. Pipers from the Mackay & District Pipe Band have competed in the World Championships in Glasgow. However, if you wish to be a social piper, that’s just fine too. The Mackay & District Pipe Band doesn’t charge tuition fees in the expectation that one day learners will be playing with the Band. Initial costs are a small membership fee, your time and the cost of a practice chanter– less than one hour per week (Thursday evenings) and ten minutes practice a day. Leaner-drummers need to purchase a set of sticks and a practice pad. Once you’ve decided you want to keep learning, you’ll probably want to buy a tutor text book with CD, which costs around $40. Pipers purchase their own practice chanters – starting at around $80 – and drummers usually buy their own sticks, which cost around $30. It will help if you have a Windows-compatible computer, e-mail, and internet access so we can keep in touch with you.